I have a 2003 model year EVT4000e scooter with a USA spec governed controller. On looking at the output of this controller, it was only running at 80% duty cycle on the PWM. After investigating different ways of getting around this (dumping voltage into the motor directly, fooling the controller to turn itself on for 100% duty cycle etc.) I decided the best path might be to build a new controller. Since I only pretend to be an electrical engineer, this was an interesting challenge. The rest of the circuit was based loosely on the original EVT controller (at least for the high current part). I was amazed at how few parts that I needed to really make it go. If you look at the original controller, it's got a whole bunch of stuff. The total for my new controller only had about 15 or 20 components (I did not bother driving the dash LED's). It was all just hand soldered up on a prototyping board. Now for the exciting part -- how does it work? I was pleasantly surprised it worked on my first attempt. I put it together into the case assuming I would just try it out and have to go make some modifications. However, it worked so well it stayed there for the next four or five days until I finally tore myself away to take it apart to finalize some of the wiring. The stock controller would do 47 km an hour on the speedo (this seems to be actually quite accurate compared to my GPS). With the new controller, it'll do about 61 kph on the flat with no wind. Wow, this is way more than I expected. I thought I might get about 5 kph. I can go on almost any road in the city (barring the freeways) and easily keep up with traffic. Thanks for listening, I'm so excited I had to tell somebody who might be interested. If anybody is interested, I can post a picture and a schematic. Congratulation on your sucessful project ! ! . Would very much like to see pictures and schematics , it sound very exciting and something I also would like to do . Would you make the software available to us .Where are you located ? nice work! I too would like to see some photos, schematic and additional info. Your top speed and range with your custom controller seems on par with what I'm seeing with a 60 volt pack. See my post regarding the 60 volt mod. I'm surprised that your EVT speedo is relatively accurate. Mine tends to read up to 10MPH faster than the GPS at top speed (which is about 35MPH on flat ground). It would be cool to see an easy controller mod to get full performance from the EVT 4000e with a 48 volt pack. Do you think a BASIC stamp could be used for the the controller microprocessor? Did you use the stock controller housing? Re: A new custom EVT 4000 controller: Current limiting? one more question: did you implement any current limiting on your custom controller? I will clean up the schematic and scan it in and post it. I don't have a photo of the new circuit board -- I buttoned up the controller casing and forgot to take a picture (I used the same un-moded casing). Next time I take it apart, I will get a picture. It looks a lot like the old one except the board is very empty. I used the same MOSFET mounting system and I also used to same throttle system (a very nice system actually - it's an infrared photo emitter/detector circuit that transmits through a graduated opening that is pulled when you open the throttle. Clean and simple.) I will post the code as well although it is a ridiculously simple and kindof a weird language. As I said, I really overkilled the microcontroller. I should've bought a small stamp that I saw for about $35. Anything that will accept a voltage signal and generate a pulse output would work. As well, at least one digital input is required to detect the kill switch and shut down the controller. 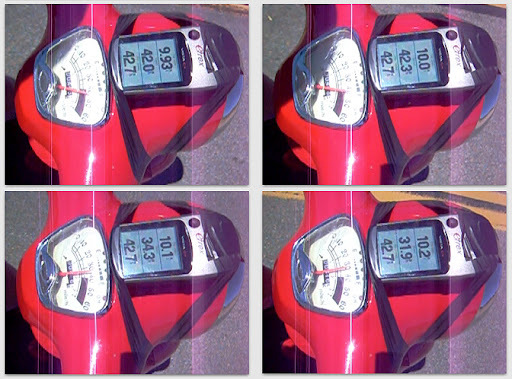 My speedo is in kilometers per hour -- maybe that's the difference. Apart from the microcontroller, this is a pretty inexpensive controller. Probably about $50 in parts. If you wanted, you could also reuse a lot of the parts in the original controller (I used the same MOSFETs (IR3710) and schotkey freewheeling diodes as the original). Granted, I'd eliminate some of the niceties -- the dashboard LEDs and a beeper. I didn't find the dashboard LEDs very useful anyway. One thing I would like to implement that I have not yet it's a temperature sensor shut down. However, it runs so cool I think that this might not be required. Anyway, I sure am happy with the performance -- while I was at it I shortened up the throttle throw. I've always thought that the original was too much -- you had to grab a big handful of it and pull it all the way back. Now, it's about half what it used to be. Tonight, I drove down one of the faster main streets in Saskatoon (Saskatchewan, Canada) and kept up or passed all of the traffic. That was satisfying. It is a shame that the original controller is governed. Once you can get inside of that microcontroller, it's so easy to change that 80% to 100%. Another option that might be worth while investigating is just to remove the original microcontroller, find out which pins do what (in terms of input and output) and jumper these to a new micro processor. The controller is good. This would be a cheaper modification -- maybe just a $50 microcontroller and some jumpers. Also -- I see no evidence of any current limiting circuitry in the original controller. They often use the copper trace on the pcb as the resistive element to sense current. seems he was aked to remove much of it. Some is still there though. definitely says Over Current Protection. My brand-new EVT-4000e should be here in about a week. There indeed maybe resistive traces on the board to sense current. Certainly, there are two large relays on the original controller that could be used to shut the whole thing down if necessary. You have to be very careful in putting resistive elements in a high current circuit. They can generate a lot of heat. For example, I had a shunt measuring current inserted in the battery line when I instrumented the scooter last fall to measure voltage and current to the motor. With this new controller, I am pulling a lot more current from the battery and this current shunt overheated and melted the plexiglass base that it was mounted on. Luckily, it was outside of the controller and nothing bad happened. There is also another way to sense current overload via a MOSFET gate driver circuit. Some of the fancier gate drivers (like the IR2125 - which I did not use) have a current sensing system that can be used to shut down the MOSFETs. However, I didn't see any of those types of chips on the old controller. I always feel that there is some confusion about current limiting. The way a battery motor system works is the battery voltage works against the back EMF of the motor (it changes with motor RPM). The difference between the battery voltage and the back EMF determines the current that will be drawn by the motor. 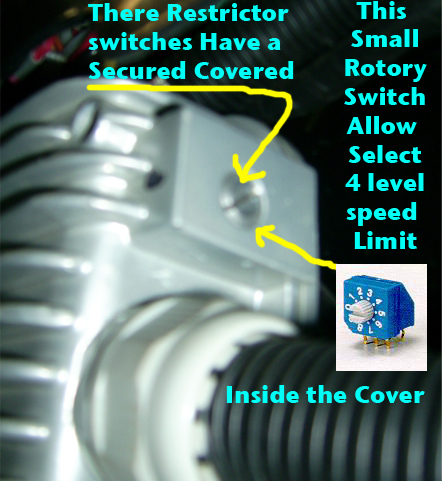 The only way to increase or decrease current to the motor is to increase or decrease the battery voltage. Congratulations on getting a 4000e! I just love mine. Here's a question -- do all EVTs sold in the United States contain the governed controller? Are they registered as motorcycles or powered bicycles? Here in Canada, they are registered exactly the same as a 1000 CC Harley Davidson and I need the same motorcycle license as well. Because of this, there is no governing required in the controllers. 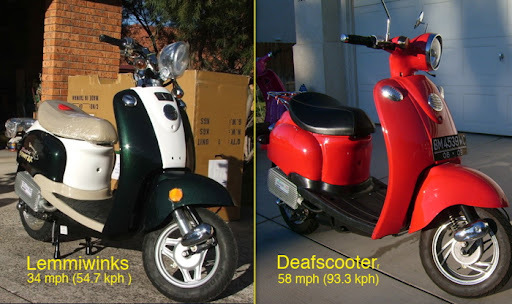 in the great state of 'Kulifonia' (as our governator calls it) electric scooters are registered as mopeds as long as they have a top speed under 30MPH. There's some other criteria as well (less than 2 braking HP, etc.) This means that you pay a one time fee for the plate of about $20.00 USD. In contrast my wife's 49cc Honda Metropolitan cost $69.00 USD this year to register and requires a motorcycle plate. I believe most US states have similar codes, hence the speed limited controllers for the North American market. I would like to see the ungoverned 'Asian' controller offered as an option for a reasonable fee. The only place I couold find one was in Canada, and they wanted over $500.00 USD with shipping. That's why I went with the Electric Motorsport 60 volt mod. about half the cost. It's not ideal as the extra battery adds weight, raises the CG, and eliminates the underseat storage, but it makes the bike practical to drive on most surface streets. Before the mod I was limited to back streets with speed limits under 25MPH for safety. Now I can keep up with traffic. That is exactly it. I don't necessarily want to get anywhere faster (the difference between 28 miles an hour and 35 miles an hour is not really significant) but you need to keep up with traffic. Before this modification, I could not on any main road. Now, I can. Here's another question for EVT owners -- does everybody get a resonance ringing during acceleration at about 10 miles an hour? I'm not sure what you mean by 'resonance ringing'. Would this sound be coming from the motor or controller? can you describe it in more detail so I can listen for it next time I take the scooter out for a ride? I haven't noticed anything I would describe as a 'resonance ringing' so far. It is the same with both the old and the new controller. When you accelerate, as you pass through about 10 mph, there is kind of a tinny ringing coming from the back end. Only for maybe 1 second. The source is the motor, but I think the battery case is actually being excited and it is making the noise as the motor passes through the resonant frequency of the battery case. It is supprising to know so many interesting topics about EVT-4000 on the other side of the planet. I had it for 3 years and changed the battery once, yet I am the only person knownto have this one around me, even though this is a made in Taiwan stuff, what a shame!! I think the most headac of this e-motorcycle to me is not speed but range to ride. The standard 48V pack can not keep up the heavy body for long riding, espically the battery itself is very heavy too. I'm recently doing research about battery of tomorrow. And this might be the answer, C-LiFePO4 , this is the web site for more information: http://www.phet.com.tw/Products/Products_Intro.aspx. Recharging duty cycle 4000 times is impressive. Plus, I heard that Tesla is going to install this battery. I have no idea how expensive or possible to modify my evt-400, but I will find out more when visited the battery company in next week. hope can share more with you guys. There are a lot of EV folks that would be interested if there is a moderately priced Lion battery/BMS package available. I second that statement. I've been looking at the DeWalt 36 volt power tool packs on eBay with the A123 cells. At this point it's still too costly to consider, given the amount of small cells necessary to get a 40-50Ahr pack at 48 volts. Then you have to create or find a BMS solution and a charger. It can be done, but takes a large investment in time and money. For now the standard AGM batteries are the best of a number of less than ideal choices. Hopefully prices for the lithium cells will fall and BMS solutions will become more readily available in the near future. Welcome to our V is for Voltage Community, thanks for the information. I'm also interested in pricing and availability of packs suitable for E-Scooters: 48V, 50+Ah and high current (>100A) capability. Should I be over-optimistic now and delay the order of new lead-acid batteries for my EVT168 ;) ? On the PHET company website I found a report that their batteries have already undergone extensive and successful testing by ExtraEnergy, a renowned German non-profit organisation promoting e-bikes. I looked at the specs of the PHET batteries and I was not impressed. The A123 batteries have about one third (1/3) higher current output rating when you compare similar batteries, voltage and AH rating, also the weight of the cells are almost equal. The A123 batteries put out more power for the same weight so I have to place my money on the A123 batteries at this time. When I was looking at the over 30AH PHET batteries they only put out half the power requirements for my bike where the A123's can at least get close. I would have to run 3 parallel packs of the PHET batteries to get the same power from 2 parallel packs of the A123's. Using this at my minimum requirements I would have to carry 24LBS of PHET batteries to get the same power as 12 LBS of A123's. I just got rid of my 30 LB lead pack and replaced it with 4 DeWalt packs with a total weight of about 12 LBS, including the battery mounts. Wow, I don't know what happen to the original question, "A new custom EVT 4000 controller"? Seems the Re: was changed several times. We'll try and straighten it all out latter, but the original post was about a controller. I think the engery density of this battery is less then Li-Iorn bettry using in cell phone according it says. What I impressed is it's signiffcantly high recharged cycle time. If an e-motocycle built in this type of battery, then there is no need of change in 10 years, even longer. My experience is that the acid battery dead in about 2 years. And soon need to prepare another replacement of my EVT. I was supprised when seen the spec of acid battery, recharge cycle is only 250(100% recharging)-750(25% recharging) times. Li-Ion is not much better, 500-1000 times. No pack details yet, but what I looking for is the 55Ah pack, should be able to replace directly. 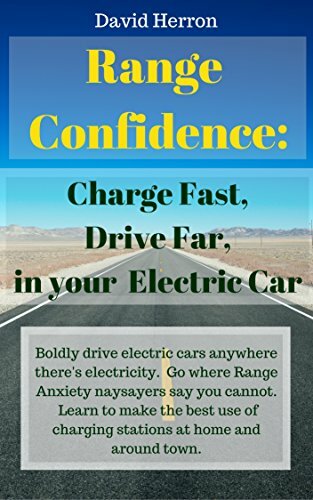 So here is my plan, if the PHET battery weight less enough, then I might be able to put more, or simply keep the EVT diet, to make it a longer riding range. The next is to check if the controller need to be modified. I guess this would be a fun project. Hope not cost too much. It's a way off topic now, so I think should move to Battery subject. I talked with PHET recently. They have 3 different cell models. the one posted on web is 1100mAh, and the other two are 1200mAh and 1600mAh. With diffent tuning, some gives higher output current, the other gives better energy density. Although A123 produced a cell in different size, if consider energy density, they are pretty much in the same level. is it possible for you to read the program from the EVT microcomputer ? I can take a look into that code and find a way to remove the speed limit. I think it's a pretty simple logic. Interesting work Craig. Do you think it's possible to modify a regulated controler or do we really need to buy an expensive asian controler ? I don't understand your mod, where is the throttle cable now ? I have a lot of experience in building new controllers based on microprocessors but have never backwards engineered an existing microprocessor to figure out the programming. I don't really know what is involved. You really need to know a lot of things about the processor and I/O scheme. I think you just need to know the processor and disassemble the code. Once it's done it's pretty easy to find the main routine, the main loop and the constants. Speed limit is probably just a constant value. How much is a knew standard speed controller unit for eve 4000e and WHwre can I get one from?